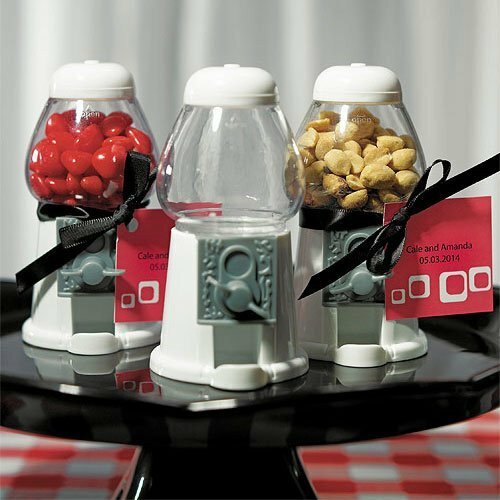 These classic-style miniature Gumball Machines make the perfect guest favor. The appeal of this adorable retro container will have all your guests anxious to take one home. Fill with colored jelly beans, peanuts, red hearts or any other suitable goodie that is in keeping with your theme. Makes a perfect DIY container. Gumball dispensers measure 12.7 cm in height, holds 50 grams. Goodies, bow and gift tag not included. You may be interested in our personalised tags for this favour!